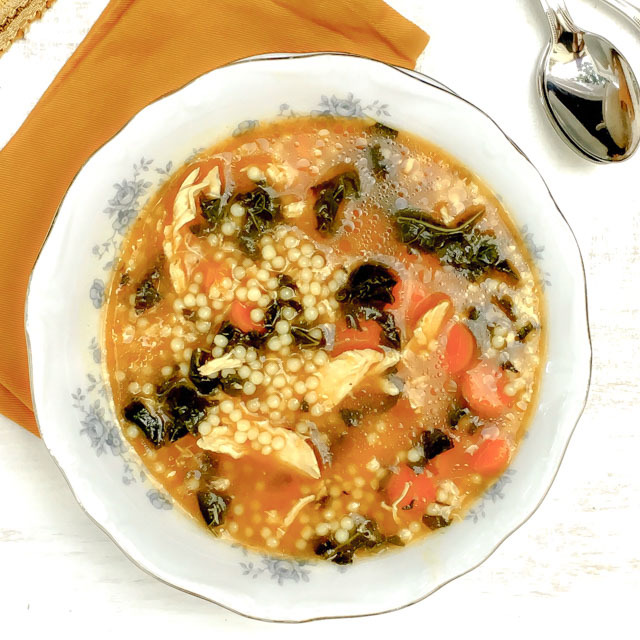 Healthy Italian-American comfort food made easy: chicken soup with pastina and greens. I was lucky to have grown up with wonderful family cooks, namely my mom and two grandmothers. And without a doubt, being exposed to a lifetime of them working their skills in the kitchen has had a profound impact on me and is a big reason why I love the world of food so much. My first cooking memory was of my mom letting me “experiment” in the kitchen. She’d put out a variety of baking ingredients and I could mix together whatever I liked. I remember LOVING the freedom that came with making my own creations, despite the fact they’d always end up being an inedible shortcake with the consistency of a hockey puck after baking. But since we already have several shortcake recipes here on the blog, including these recent Strawberry Lemon Cornbread Shortcakes, I thought of my next cooking memory which was making pancakes every weekend —> which I already wrote about in this Everyday Whole Grain Pancake post. I’ve also talked about cooking memories via One Pot Chicken with Olives + Mushrooms, Kale Stuffed Lasagna Rolls, Kapusta (Braised Sauerkraut), and Cherry Chocolate Jubilee Jumbles. So, I was actually stumped for a bit on what to make and then I remembered this soup. So, I came up with my own version of that soup. Rather than meatballs, I used shredded chicken (time saver) and used kale since I had it on hand and since escarole is not the “it” green….yet! In a large skillet, heat oil over medium heat. Add garlic, carrots and kale. Saute (stirrng often) for about 5 minutes or until kale is wilted. Stir in salt and pepper. Add chicken and chicken broth. Bring to a boil. Turn to medium low, cover with lid and simmer for about 15 minutes or until chicken is cooked through. Remove chicken onto cutting board and cool for 10-15 minutes. Shred with forks. While chicken is cooling, bring broth back to a boil. Add pastina and reduce to medium heat. Stir occasionally (especially at beginning of process as pastina will stick to bottom of pan) and cook until pastina is cooked, about 10 minutes. Add shredded chicken and heat for another 5 minutes. Ladle into bowls and top with Parmesan cheese, if desired. What’s one of your favorite cooking memories from childhood? What soup do you always eat or make this time of year? 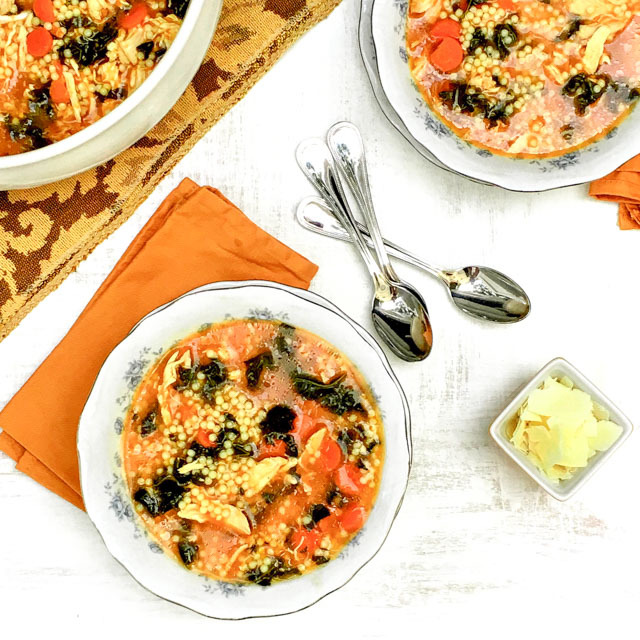 This looks like the perfect healthy and satisfying soup for fall. I loved this months challenge as well since it allowed us to reflect on some of the wonderful memories of our childhood. Me too – love reading about everyone’s family memories!! I also come from an Italian family so my childhood memories are of making pizzeles and wedding soup- our family actually makes it with chicken and tiny meatballs. Love the taste of nonstalgia! Ahh pizzeles – my nana and grandma have made THOUSANDS over the years. I never master them myself! How cute that the kids got the “strained” version…what a great memory! This soup looks amazing and sounds so comforting and full of flavor. 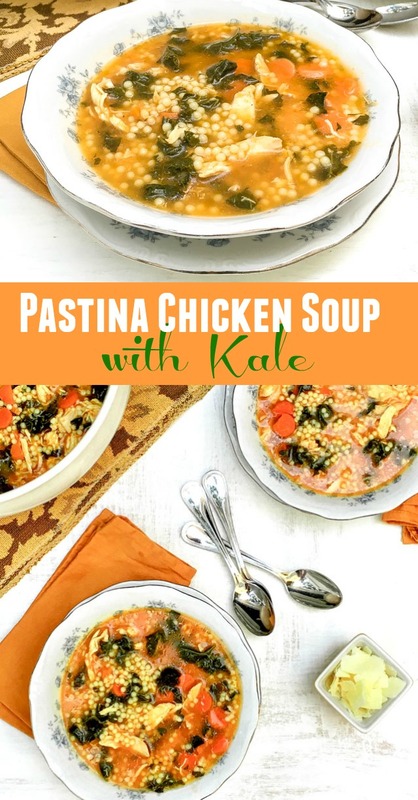 This sounds like total comfort food to me, I lived on pastina as a kid! I love this recipe! I’ve already shared with a few of my friends! I made this and it is so yummy! My new favorite soup. I love how healthy it is. I added bok choy and next time I will try diced tomatoes. I couldn’t find pastina so I used Israeli cous cous.